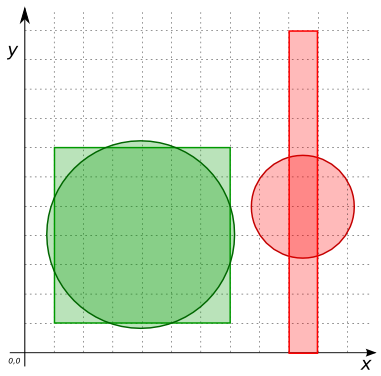 ST_CompactnessRatio computes the perimeter of a circle whose area is equal to the given POLYGON’s area, and returns the ratio of this computed perimeter to the given POLYGON’s perimeter. Equivalent definition: ST_CompactnessRatio returns the square root of the POLYGON’s area divided by the area of the circle with circumference equal to the POLYGON’s perimeter. Note: This uses the 2D perimeter/area of the POLYGON. This function accepts only POLYGONs. Note: In this example, both geometries have a perimeter equal to 24. --    Note: A buffer is a polygonal approximation to a circle. --    compactness ratio is slightly less than 1. --    Note: ST_MakeEllipse approximates using 100 line segments. --    result is closer to 1 than the result from ST_Buffer.